Male and female participants in Saturday’s race will be competing for the BVI Tourist Board top prize of $1,000. 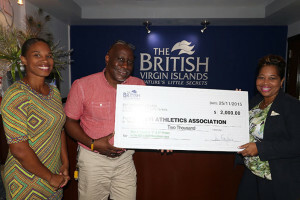 Here, BVI Tourist Board Director Sharon Flax-Mars, right, and events coordinator Cindy Rosan-Jones, presents a check to BVI Athletics Association president Dean “The Sportsman” Greenaway. With 100 persons pre registered for Saturday’s 10th annual Deloite-Ogier BVI Sunrise Half Marathon presented by the BVI Tourist Board and the BVI Athletics Association, this year’s edition will see the fastest race in the last five years. The race is the first event of the BVI Athletics Association’s 45th anniversary activities that continues with association’s 7thAwards Gala on Dec 29. Events run through July with the hosting of the OECS Track and Field Championships. For the last three years, St. Thomas’ Shane DeGannes has dominated the event. This year DeGannes will have a bevy of challengers led by St. Vincent and the Grenadines’ Pamenos Ballentyne. Ballentyne was third in the fastest race run here during the 5th edition run in conjunction with the OECS Half Marathon in 2010, when he ran 1:09.50, as the course record of 1 hour 07 minutes and 38 seconds was established. BVI’s Katrina Crumpler will seek to defend her run against St. Thomas’ Ruth Ann David, who has won the event two successive year’s before Crumpler and came within 10 seconds of the 1:34.09 fastest women’s time. Then there’s Rosmond Johnson and Melissa Brunner among others who will be seeking to place in the top five finishers, as the women too will have their battle on the road.